The UK is having an uncharacteristic early May. It's cooled down from the scorching hot bank holiday weekend we had last week, but it does seem like we skipped spring and went straight from winter to summer this year. The Grand Prix weekend also promised to be a study in contrasts. I say Grand Prix weekend, but that should really be Grand Prix, plural. 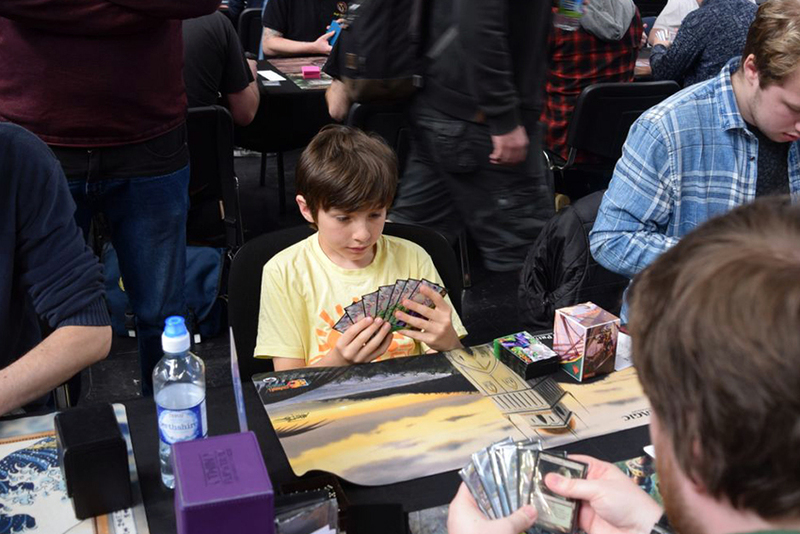 Grand Prix Birmingham was the second double-GP of the year after Seattle last month. Yup, that's two Grand Prix, in the same place, over the same weekend, which made for one mega weekend of Magic. 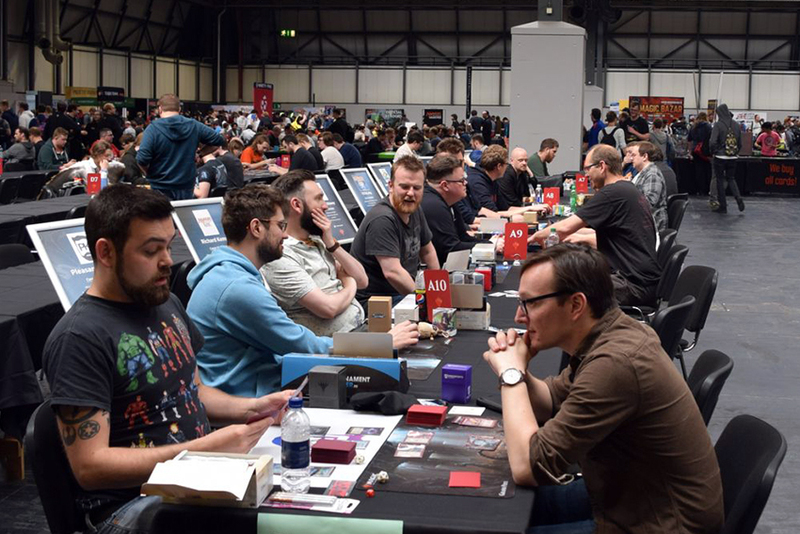 The tournament (okay, tournaments) was (were) held in Hall 12 of the NEC in Birmingham (England, not Alabama, sorry to the disappointed Alabaman who seemed confused by this on twitter). Day 1, on Friday rather than Saturday, was all about Legacy. Being an old dinosaur myself, I do have a soft spot for the Legacy format. This is where we get to see players sling truly iconic cards from Magic's 25-year history. Legacy can see some truly explosive opening turns, whether it be making an indestructible 20/20, locking an opponent out of the game with Chalice of the Void or Blood Moon, or even killing them outright with Goblin Charbelcher. If that sounds too scary, there's no need to worry. The Legacy format also has the safety valve of Force of Will to keep things from getting too silly. And you've never really played Magic unless you've had the pleasure of drawing three new cards with Brainstorm and then shuffling two unwanted cards away with a fetch land. In total we had 1200 players travel to Birmingham to battle it out. 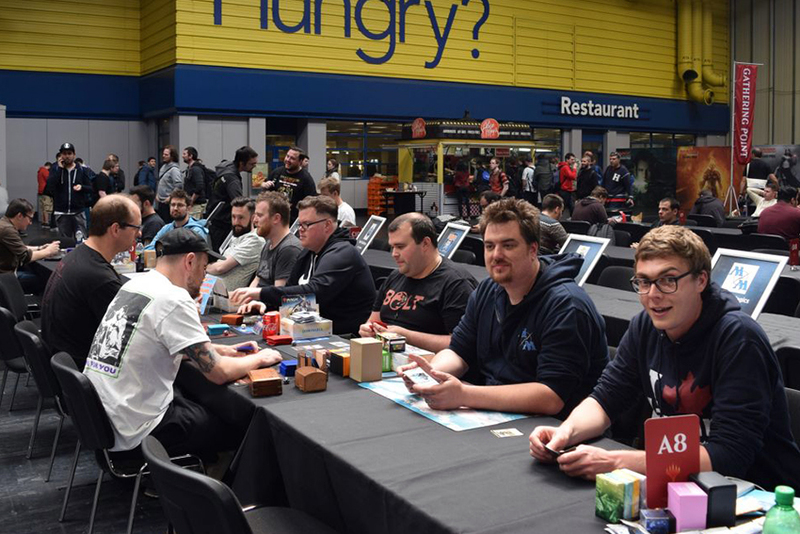 From talking to various UK players the day beforehand it seemed like both Mono-Red Prison and Miracles would be popular amongst the local players. Legacy is a format that rewards knowing the minutia of various card interactions. There was a beautiful example of this in the very first round (you can watch this match on video coverage). 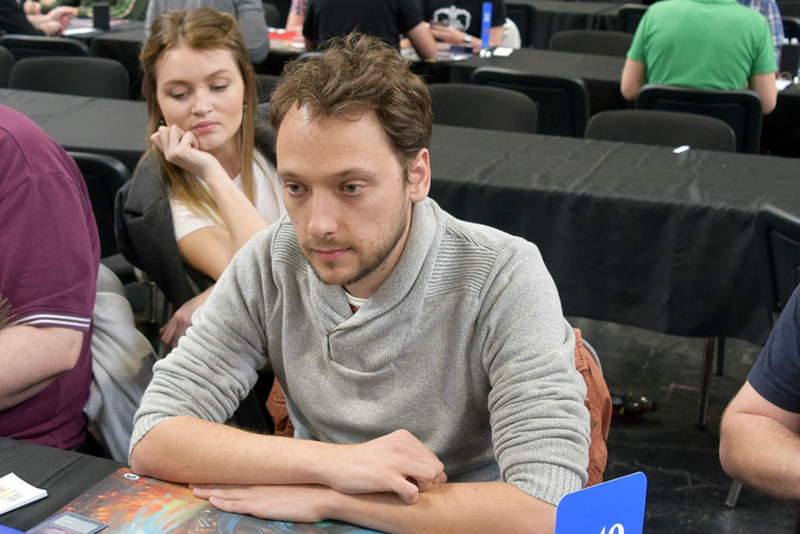 Vladimir Arneuve, winner of the Legacy main event at the European Eternal Weekend last week, was playing the Dark Depths combo mirror. The combo involves getting a copy of Dark Depths in play with zero counters on it, which then becomes an indestructible 20/20 Marit Lage token, which usually is enough to batter an opponent to death in short order. One of the ways to remove all the counters from a Dark Depths is to copy it with Thespian's Stage as the Stage becomes a Dark Depths with no counters on it. This becomes a little more complex in the mirror match as Thespian's Stage can also copy your opponent's lands, so they too can grab a 20/20 flying horror from your Dark Depths. With both players having a Thespian's Stage in play, Arneuve used his to copy a Bayou and then played Pithing Needle naming Thespian's Stage. This shut off all present and future Thespian's Stages... except Arneuve's, which was currently a Bayou, but more importantly—a Bayou that retained the land-copying ability of Thespian's Stage. This left the way open for Arneuve to make his game-ending eldritch abomination without interference from his opponent's Stage. I also heard a few more cute tricks for Lands or Turbo Depths decks. Against Show and Tell, you normally don't get priority if your opponent drops Omniscience off the deck's namesake card. Both revealed cards come into play, then priority goes to the Show and Tell player, so they're free to cast Emrakul for free even if you have something like Krosan Grip in hand. However, if you use their Show and Tell to drop a card with a triggered ability such as Bojuka Bog, the triggered ability going on the stack opens the window to remove the Omniscience with a Disenchant effect before priority goes back to them to cast their game-ending eldritch abomination. How Blood Moon works has been subtly updated. With a Blood Moon (or similar effect) in play, Dark Depths enters the battlefield as a basic mountain with zero counters. Now, should you remove that blood moon effect, you'll be left with a Dark Depths with no counters, and—as we already know—that results in a 20/20 game-ending monstrosity. This scenario was recounted to me as something that happened in one of the practice games yesterday. On seeing a first turn Wasteland from his opponent, a Mono-Red Prison player did what Mono-Red Prison does and dropped a Magus of the Moon on turn one. Unfortunately for him, his opponent followed up with Dark Depths, which entered as a mountain with zero counters. He then tapped both of his “mountains” to Punishing Fire the Magus. This turned his “mountains” back to their original form—a Wasteland and a Dark Depths... with no counters on it. Uh oh. Cue 20/20 face-smashing. Ultimating Liliana is a pretty sweet experience. How about ultimating two Liliana's... in the same turn. That's a guaranteed game win, right? You'd think so. After being hit with Liliana of the Veil's ultimate, Paul Wray's opponent was left with no cards in hand, only two lands in play and facing down Liliana, the Last Hope's growing zombie horde. Okay, you can probably guess. It involves low life totals and a burn spell, but this one was slightly classy. His opponent Pondered into Fireblast and blew Wray away, ending the game with just a solitary island in play. Sometimes two Lilis are not enough. Commiserations to Paul Wray. Ultimating two Lilianas in the same turn and going on to lose must be a rather unique experience. But on the other hand, to win with nothing but an island in play and facing down a Liliana, the Last Hope emblem makes for an awesome story for his opponent. I'm always on the look out for interesting stories, so when someone came up to the desk to tell me about a very young child having a blast (literally, as you'll find out) in the Grand Prix, I was eager to check it out. Meet Oliver Lobreglio. Oliver is 10 years old and hails from Oxford. He was here, playing in his second Grand Prix and accompanied by his father, John. 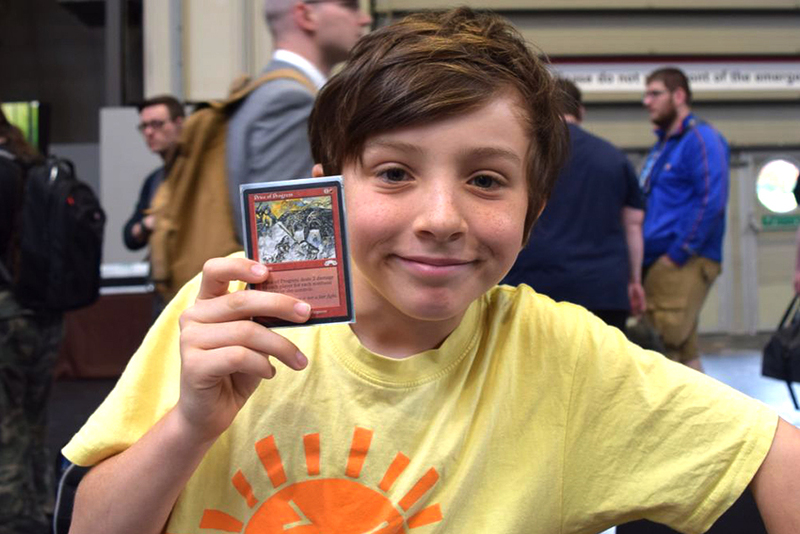 Oliver was running Burn, his favorite Legacy deck. If you can't get hold of dual lands, you can always make sure you punish your opponent for running them, and old burn favorite Price of Progress very much fits the definition of punishing. Oliver has been playing Magic for two years. He started playing with friends at school, but his interest in the game really took off after a summer trip to America where he played a lot of games with his uncle and older cousins. Usually you'd think it would be a case of father teaching his son the game, but in this case it was the opposite. 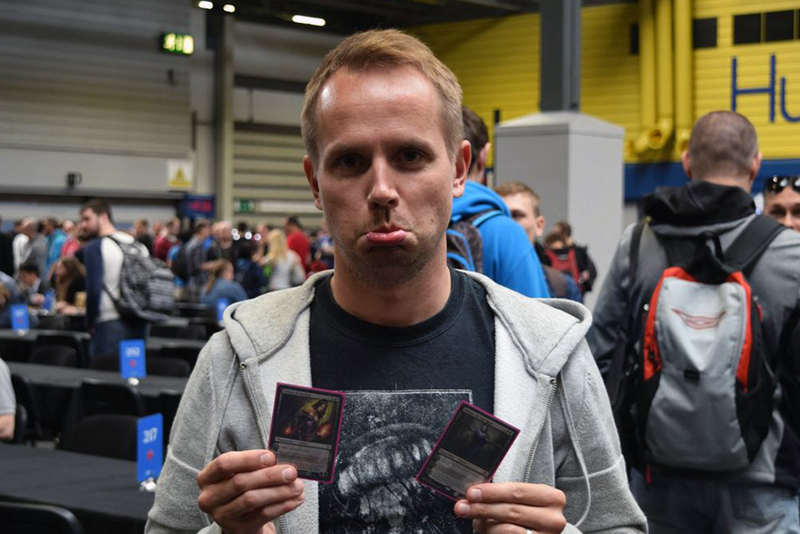 John wasn't playing in the main event as he's still learning the game and didn't feel too confident about Legacy. Prereleases are more his level at the moment, but he does enjoy the complexities the game throws up. Oliver had a pretty good day overall. He didn't make the requisite 6-2 record for day 2, but did finish with a creditable 4-4 record in this, his second Grand Prix. He'll also get a chance to play in his third tomorrow, as this weekend is a double-header, with the Standard Grand Prix starting on Saturday. Of course, playing in the main event is not the only thing you can do at a Grand Prix. Along with the usual side events, you can also get your favorite cards signed by your favorite artists. I've been to many Grand Prix over the years, but I don't think I've ever seen this many artists in attendance. I think nearly every year of Magic card art was represented here and I think most of the artists were kept busy. 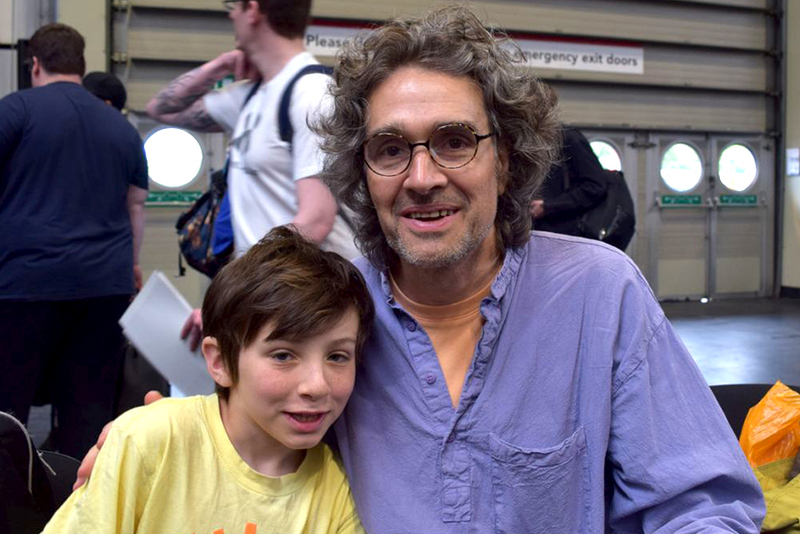 Every time I walked past John Avon's table I saw a massive queue of eager fans. Have mercy on the poor man, Magic players. How will he be able to create more of these gorgeous land arts if his hand falls off from excessive card signing? As one of the oldest of dinosaurs, I like to think I've got a good handle on the Magic scene, especially the UK one. But then every so often I encounter gaps in my knowledge, or in this case—a gaping chasm. Gunslinging has long been a tradition at major events. This is where members of the public get a chance to play against Magic's various personalities. Most of the time this is usually versus obliging pros such as Martin Juza or Andrea Mengucci. This time I saw a lot of plaques with names I didn't recognize. Who or what is a PleasantKenobi? Orcs Head Magic? TotalMTG? LifeBeginsAt20? “Content creators," someone more versed in that sort of thing explained to me. These are people that provide hours of Magic-related entertainment on Twitch or Youtube. The ones here are also mostly Brits, which made my lack of knowing who they are even more shameful. It's like finding a whole new world you never knew previously existed. Unfortunately, I didn't find time to talk to them in great detail, but they will be here all weekend. 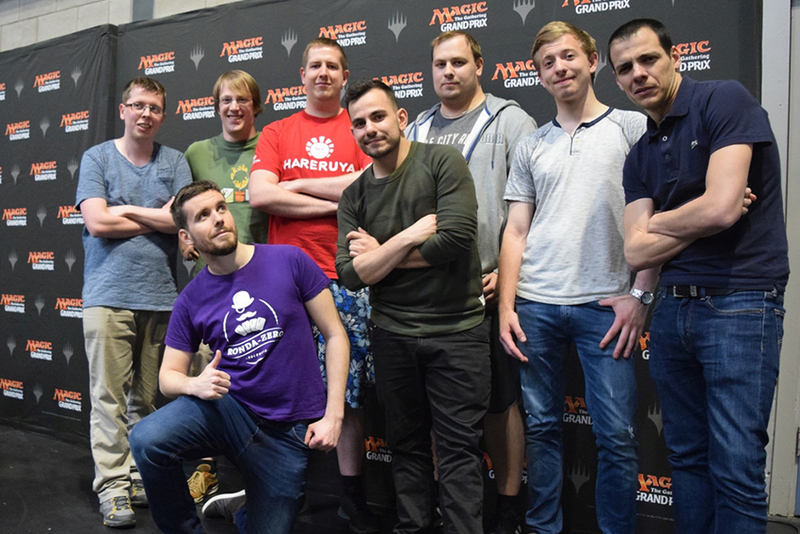 Come over and challenge your favorite UK Magic streamer or youtuber, they seem like lovely folk. There was so much going on I feel bad for not mentioning AtlasCraft's fantastic Karn cosplay. Okay, the giant silver golem has already walked the halls of Bologna, but it is so damn good I almost feel bad for not writing another piece about it here. If you missed the Grand Prix Bologna coverage and don't know what I'm talking about, check out the various pictures people have posted in our cover-it-live section. Karn walks and has to be seen to be believed. But of course, I shouldn't forget the main event. 1200 players turned up to play Legacy and by the end of the day only 220 of them were left. Standing at the top of them were the 8 players that had run the tables to go into Day 2 with perfect 8-0 records. They were Sebastian Finkes, Johan De Gruyter, Grzegorz Kowalski, Andrea Cibak, Lukas Muller, Grant Fishman, Guillem Salvador Arnal (standing left to right), and Sergio Ferrer Rozalen (kneeling). Grixis Delver remains the deck to beat. Four of our undefeateds were running variations of that insectile aberration. But we also had Elves, Mono-Red Prison, Czech Pile and the less familiar Steel Stompy (Legacy's version the Vintage Ravager-Shops deck, not as powerful without Vintage powerhouse Mishra's Workshop, but potent enough to post a perfect record on the day).